What if Romeo and Juliet’s star-crossed lovers were actually in the business of, y’know, crossing stars? Verona’s Romeo is an Extractor – a treasure hunter hired to grab valuables from an Earth destined to crash into the sun, and take them to the homesick rich living on off-planet colonies. Its Juliet is the daughter of a high-ranking ‘Chevron’ – a quasi-policeman with the Global Traffic Department in charge of evacuating the world. 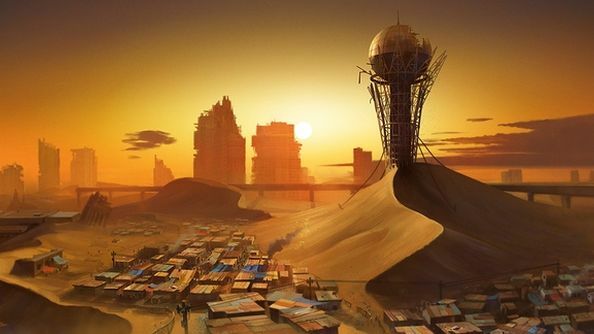 As a player, you return to near-apocalyptic Earth with a group of extractors to dig up fine art, artefacts and famous landmarks for the wealthy – but “find something more valuable”. That something will be the subject of a 10-15 hours single player story stretched across five episodes, Telltale style. The play will somewhat resemble Telltale’s work too, in that you’ll explore “closed” worlds housing multiple routes and solutions, and be at the mercy of a crew member karma system affected by your decisions. But there’ll be third-person shooting segments too, inspired by the “elegant” merc-popping of Uncharted. In each episode, you’ll be working to extract something important, interesting or ginormous, solving environmental puzzles and scavenging levels with an upgradable drone: the ‘Firefly’. That’s not all Verona takes from Whedon: Budapest studio Prior Games are also planning to replicate his character chemistry and the concept of ‘good bad guys’. You can help fund Verona on Kickstarter. Are you up for a bit of 22nd century sexual tension?